Familiarity breeds contempt. We tend to despise and underrate that which is readily available to us. This is the summary of the history of new world heavy weight champion Anthony Joshua with Nigeria, his parent’s country of birth. 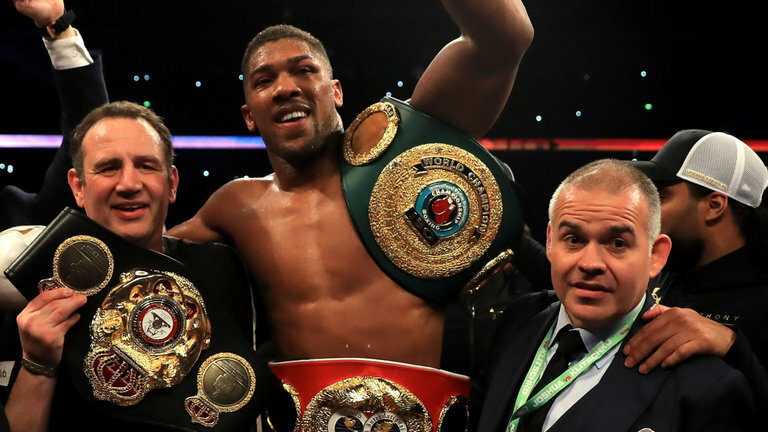 Since the young man gained more prominence following his latest and biggest title win yet, after defeating Ukranian, Vladimir Klistchko, there has been some debate about his country of origin, and who really has the right to claim him. It is befuddling and amusing, as one would have assumed the answer was a no-brainer. Joshua is British born. He is a citizen of Britain, and represents the country every time he steps into the ring. But how did this needless debate even come about in the first place? Many Nigerians are eager to claim Joshua as one of their own. After all, his parents are Nigerians, and the young man himself spent some part of his childhood here. He even chose to identify with Africa, and Nigeria in particular by getting a tattoo of the map of Africa on his arm. What’s more, he has attributed his success to our ever reliable staples, pounded yam and eba. He may represent Britain on paper, but his heart is here with us we boast. While Joshua’s big heart may see him identify with Nigeria, we must ask ourselves if we as Nigerians really have the right to appropriate his accomplishments. I know that success has many fathers, while failure is an orphan, but it smacks of a lack of introspection when one is quick to claim a stake in the achievement of a feat they never played a part in bringing to fruition. It’s the same way an absentee parent hardly possesses the right to take credit for their child’s eventual success. The question is, when will Nigeria realize that it cannot abdicate its responsibility to build capacity in its citizenry when it should have, and expect to be acknowledged when one or two of those who are lucky enough to seek greener pastures in saner climes are able to shatter stereotypes solely by their own efforts? If Anthony Joshua has chosen to identify with Nigeria, it’s not because he owes the country any form of loyalty, rather it is a gesture that simply wells from the magnanimity of his heart. The story of how the boxing champion who has been compared to Muhammed Ali was denied the chance to represent Nigeria when he was keen to represent the country at the 2008 Olympics is one many Nigerians can relate to. While a section of the populace are still ruing what could have been if only the coaches of the Nigerian boxing team at the time had foreseen the level of stardom Joshua would attain, and had let him into the team; others maintain that Obisia Nwankpa, the chief coach did the right thing by not accepting Joshua, since he showed up late for the trials. I cannot blame Nwankpa, even though like many of my compatriots a part of me wishes Joshua were donning the colours of Nigeria rather than Britain. Even if we were to attribute the loss of the glory he would have brought to Nigeria had he flown the green-white-green flag to providence, what do we allude the enormous amount of brain drain experienced by the nation daily to? Every other week, we read and hear of some British or American of Nigerian descent who has just been a accepted into all eight Ivy league schools in the US. We hear of Nigerians who are doing great exploits in their fields of endeavour in foreign lands. Even as we are proud of high achieving Nigerians in the diaspora, we have also become more resolute in the belief that Nigerians are indeed some of the most talented and hardworking people one can ever come across. The truth is that the country has a reputation for despising its talents. But that is not the crux of today’s piece. For me, the biggest lesson in all of these is that no one wants to be associated with a failure, or even the mediocre. The best way to get people to pay attention to you is to be successful, hugely successful. It’s the most profound response to any act of slight. When your work speaks for you, you won’t have to post subliminal messages to real or perceived naysayers on social media. Throwing “shade” is for the childish, the unaccomplished…the petty. The Mo Abudus, Oprah Winfreys, Aliko Dangotes, Bill Gates and even Zuriel Oduwole, (the 14-year old girl whose advocacy made her the youngest person to be interviewed by Forbes) of this world won’t be caught dead wasting precious time bemoaning missed opportunities. They don’t dwell on what every John Doe has to say about them. They are too busy with the process of building on their success. Even the good book acknowledges the inevitability of a diligent person to stand before kings. Anthony Joshua was rejected by Nigeria, but that didn’t deter him from reaching his potential, and achieving resounding success to boot. And now everybody wants to be associated with him. Individuals and government are falling over themselves to get his attention; with the Ogun State government reportedly set to name the Sagamu International stadium and a street after him. If that’s not enough motivation to ditch the victim mentality and strive for excellence, I don’t know what is. What i learn here is that, it does not matter if people had despised or ignored you. The right attitude is to keep working towards the attainment of your goal. When success comes,those that once rejected you will be scrambling to get close. Thank you so much for this. It’s those who value gold that deserve to have it. If we had given him a chance here in Nigeria, we would have made a mess of his career. We’re not golden in our attitude. Hmmmm…certainly something to chew on. Thanks for contributing.